We are a leading Wholesale Trader of price computing scale from Ahmedabad, India. 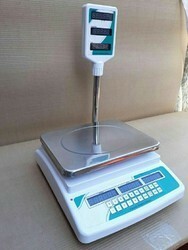 Price computing weighing scale is used for industrial, retail and for Weighing agriculture products.Price weighing scale is also use where using no of products for Weighing . High quality rechargeable battery is used in this scale. Its battery backup is minimum 24 hrs in continuing uses.its products memory storage capacity is 999This price computing weighing scale has front and back LED (Red or green) display as well as pole display as per customer choice.